ANAHEIM, Calif. (KABC) -- Investigators on Saturday were looking into the cause of a fire at a famed Anaheim restaurant. About 40 firefighters from several Orange County agencies battled the blaze at the Anaheim White House Restaurant in the 800 block of Anaheim Boulevard around 4 a.m. The intense flames took about 30 minutes to knock down, according to the Anaheim Fire Department. No one was injured but the damage was so extensive, crews had to stay and monitor hot spots for nearly three hours. 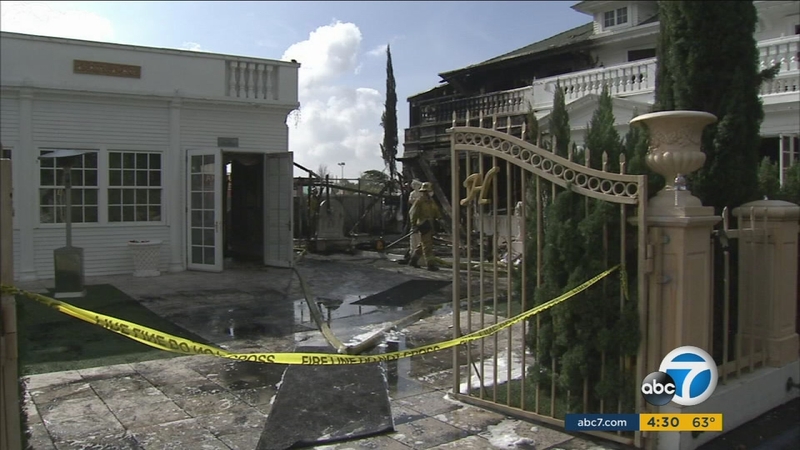 Anaheim police were at the scene to help determine the cause and origin of the fire. The restaurant owner, Sir Bruno Serato, believes the fire may have been electrical and originated from the dining area. The kitchen and bar areas were untouched in the blaze. The 1909 Colonial-style mansion is a family owned Italian restaurant that also donates 2,000 meals to children in local charities every night, according to a press release from Anaheim White House. Serato has actively donated for more than a decade. Serato fought back tears Saturday afternoon as he surveyed the damage to his restaurant. He said he was able to salvage an important keepsake - a rosary given to him by Pope Francis. "I never thought I would see what I love the most, besides my family and the children, gone like this," he said. A local restaurant has offered to let Serato use their kitchen for him to keep his charity going, but his beloved place is closed indefinitely. Authorities said the estimated damages for the building may be as high as $1 million. Serato said he plans to rebuild. "It's like somebody put a knife in my heart, in my soul. But I have faith when people fall, they're to stand up again. I will stand up again, and for my customers, be patient. Stay with me and we will come back," he said. A GoFundMe page was created to help rebuild the restaurant and continue its charitable work. To donate, go to www.gofundme.com/AnaheimWhiteHouse. Anaheim Boulevard was temporarily closed to traffic in both directions between Vermont Avenue and South Street but has reopened.